This could have been seen as audacious. Instead, it had the smell of a not so well concealed sponsorship, the backing of a meaty foreign hand. Venezuelan opposition leader and President of the National Assembly Juan Guaidó decided to take a quick step in the direction of the presidency. His own counterfeit theory is simple: he is not being a usurper, so much as a panacea for the usurpation by the current president, Nicolás Maduro. But even Guaidó had to explain, despite deeming Maduro an unrecognised figure, that Venezuela was not your vanilla, crackpot dictatorship wedded to the use of police powers. Pity, then, that Guaidó needs so much outside help to make his call. Maduro, understandably, fumed at the challenge. But dignity is a hard matter to retain in broader geopolitical dramas. Shame, compromise, and a general muddying of credibility tend to follow in such foreign incursions. The official Venezuelan president cannot be said to have been a friend of state institutions. He is holding power under a form of sufferance. His interpretation of the democratic mandate can be said to be sketchy at best, a feature not uncommon in the history of the Americas. Authoritarianism breeds revolt, which breeds authoritarianism, a default revenge mechanism. But Maduro has good reasons to sneer at his opponent and the warm embrace by US officials of the movement seeking to remove the Chávista. The memory of 2002 and the failure on the part of Washington to remove Hugo Chávez remains strong and, in some ways poisonous; the failed coup resulted in attempts on the part of Chávez to neutralise the power of his opponents, be they in the Supreme Court or the corporate media. Mass round-ups and executions were resisted, but authoritarian counter measures were used. Maduro has merely been one of Chávez’s keener students in that regard. To this dysfunctional mess can be added the pervasive, consistent and persistent molestation of US foreign policy. Gardens in Latin America have been trampled upon by US thuggery since the Republic was founded, and the tendency is instinctive and genetic. That thuggery also shares a neurotic relationship with democracy, the product Washington finds hard to export while scuttling the democratic projects of others. Hustlers and gamblers are not, by their dispositions, democratic: they believe in the doomed nature of change, and, to that end, identify the steady horse they would wish to back in any political race. If that horse is sympathetic to capital interests, despite kicking in the teeth of liberal democracy, all the better. While apoplectic hysteria governs the US security heavies from the Hill to the public talk circuit about Russian electoral interference, dispensation will always be given to meddling in the affairs of others. Trump, for one, has acknowledged Guaidó’s declaration as legitimising an interim presidency, one that will arm an opponent of Maduro and ensure a transition of loyalty to the United States. The international reaction has been illustrative of the broader issues at stake, making it far more than a matter of pure bullying from Washington. Other countries have decided to make Venezuela their business, some by suggesting that it should not be the business of others. Mexico remains an observer of the status quo. China and Russia have taken the view that non-interference should be the policy while Turkey insists that Maduro dig in. Cuba and Bolivia had defended the incumbent, but Brazil, Colombia, Chile, Peru and Argentina have gone the whole hog in accepting Guaidó. Liberal democratic states have shown themselves presumptuous enough to violate the UN Charter in directly stating their willingness to back Maduro’s opponents. 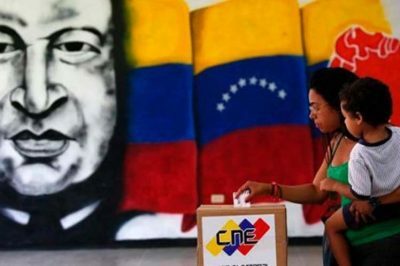 Even timelines have been advanced and demands issued that directly impair the Venezuelan political process. Given Macron’s own tarnished legitimacy as leader, harangued as a charlatan intent on market and labour reform, this came across as rich posturing. The same with Spanish Prime Minster Pedro Sanchez, yet another figure who has decided to make Venezuelan politics a matter of personal interest. And to think that Sanchez can hardly be said to have a standing vote in those elections. As in other countries, the fate of the incumbent government may be decided by the loyalty of the army. The position, as stated by the country’s defence minister Vladimir Padrino, is that the armed forces do not, at this point, recognise the usurping antics of the opposition leader “imposed by shadowy interests… outside the law”. Such stances, as history shows, change. From this whole mess, one conclusion may be drawn. Venezuela has ceased being a midget to be pushed over by the obese villain and its allies, though it still risks succumbing to the dictating wishes of others. Maduro has severed relations with Washington, issuing marching orders to US diplomats. But the schismatic spectacle of two governments seeking to pull the strings has become an absurdly disruptive prospect. Any state that has suggested this as feasible should be wary of what they wish for.